It was one of those moments in which something fundamentally disturbing sneaks up on you before you have a chance to put your guard up. I can vividly recall each instance this has happened to me, and last night I can add another to the list. I was stretched on the couch, reading a fabulous book and sipping on fresh coffee. I had the television on in the background, and the news had begun. For a moment, just a moment, my attention broke away from the book and caught an image on the screen. The video displayed an Afghanistan man gleefully smacking two rocks together, a wide grin on his face. He looked like he was preparing for something quite fun and exciting, the look of anticipation in his eyes. The announcer then matter-of-factly proclaims that women’s rights in Afghanistan are still abysmal as evidenced by this stoning of an Afghan woman for alleged adultery. The video then flashes to a woman huddled in her black robes, completely hidden in heavy folds of cloth as the crowd surrounds her, ready to bludgeon her to death...with glee. I madly fumble for the remote, my heart pounding and tears welling up. I flash the TV off but the damage was done. I wasn’t ready for that, I wasn’t mentally or emotionally prepared and the image is now lodged deep in my psyche. The wall wasn’t up and I will now always see the face of a man grinning, clapping the rocks together in anticipation. Now, to any person in western culture, this act is horrific and an abomination. Any Christian, any pastor would shrink at the idea of stoning someone to death. Yet these horrific laws are an integral part of the Christian faith itself. God’s so-called perfect laws provides bountiful opportunity to kill someone in a most violent, slow and horrific manner. If a damsel that is a virgin be betrothed unto an husband, and a man find her in the city, and lie with her; Then ye shall bring them both out unto the gate of that city, and ye shall stone them with stones that they die; the damsel, because she cried not, being in the city. If any man take a wife, and go in unto her, and hate her ... and say, I took this woman, and when I came to her, I found her not a maid: Then shall the father of the damsel, and her mother, take and bring forth the tokens of the damsel's virginity unto the elders of the city in the gate: And the damsel's father shall say ... these are the tokens of my daughter's virginity. And they shall spread the cloth before the elders of the city. ... But if this thing be true, and the tokens of virginity be not found for the damsel: Then they shall bring out the damsel to the door of her father's house, and the men of her city shall stone her with stones that she die. They found a man that gathered sticks upon the sabbath day. 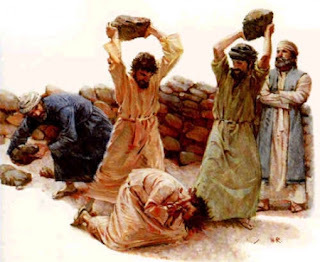 ... And the LORD said unto Moses, The man shall be surely put to death: all the congregation shall stone him with stones.... And all the congregation brought him without the camp, and stoned him with stones, and he died; as the LORD commanded Moses. A pastor once told me that this demonstrates just how serious sin really is, and how merciful God is when this is clearly what humanity deserves. I ask him to imagine it. Imagine regular violent deaths occurring at the hands of friends and family. Imagine children seeing their loved ones bludgeoned by their neighbours. Imagine actually throwing the stone at some poor woman’s skull. Would you gleefully clap the rocks together, waiting for your favourite Sunday activity? Nothing like a good stoning before a pot-luck supper. And yet this pastor, earnest and intelligent, just looks at me with the light turned off. I can see his eyes lose focus, as he searches for something that will mollify me, rather than actually imagine what this so-called “light of the earth” society was truly like. This society that was to be a beacon of God’s love to the whole earth looked a lot like modern day Afghanistan under Taliban law. And if god’s command to “Put the evil away from you” is necessary, for argument’s sake, then why is such a brutal and bloody manner necessary? Why doesn’t god stop their heart as soon as the accused is deemed guilty? Why doesn’t god do his own dirty work in the most painless way possible, rather than forcing violence on men from the hands of men? I am nauseated with the old-testament atrocities committed in the name of I AM. And so, I am left with a horrible feeling in my stomach, knowing that people on this earth still suffer under such atrocious laws. I am nauseated with the old-testament atrocities committed in the name of I AM. And I am sick with disappointment in so many Christian friends that refuse to see the horror for what it is and make excuses for their god.